Traveling light is the ideal way for the digital nomads and adventurers of today to see the world. The right travel backpack gives you a place to safely store all your essentials without having to carry multiple cumbersome bags. An ideal travel backpack keeps all your gear in one easy-to-carry container. Our list of the Top Ten Travel Backpacks includes selections that are specifically designed to be the only bag you’ll need for your travels. After check out our top ten, be sure to read through our comprehensive Buyer’s Guide to learn the most important factors to consider when choosing a new travel backpack. Ideal for the lightweight business traveler, the Nomatic is a carry-on sized pack with an internal, zippered laptop sleeve to keep your computer safe. The exterior of the pack is made with lightweight and durable Kodra tarpaulin that’s also water-resistant. The pack’s Kiss-lock zippers also function to keep water out and your belongings safe. This pack boasts an internal mesh divider that allows you to keep your everyday-carry items separate from electronics. The pack’s capacity can expand to 30 liters in total and it weighs just 4 pounds when empty. Perhaps best of all, the internal laptop pocket in this pack is TSA-approved (1), which means you can simply lay the pack flat and pass through TSA checkpoints quickly and efficiently. This internal frame backpack is ideal for travelers taking extended vacations to far-flung regions of the world. It gives you a total of 3400 cubic inches of internal space for clothes, electronics, everyday carry items, and a few fun belongings you’ll want on the road. It’s also one of the most budget-friendly travel packs on our list. The Teton Sports Scout 3400 offers adaptability to your body type for comfortable carrying over longer distances. It features multi-position torso adjustment, a durable open-cell foam lumbar pad, and molded channels for increased airflow and comfort. Finally, this travel backpack helps you stay organized with a designated sleeping bag compartment, compression straps, and a number of exterior pockets for those items you’ll need at a moment’s notice. The Osprey Farpoint 40 is ideal for the U.S.-based business traveler or the international jet setter. Its sleek design means it’s fashionable enough to take right into your meetings with you and its functionality makes it the only travel backpack you’ll need, whether you plan to use it in urban or wilderness environments. 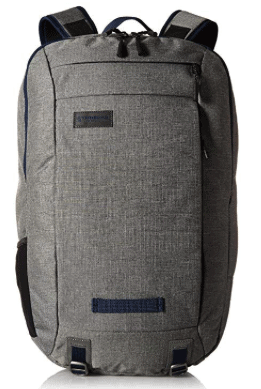 This travel backpack offers 40 liters of internal storage and boasts total dimensions of 22” H x 14” W x 9” D. The pack comes with two internal compression straps to help secure your belongings and handle loads up to 40 pounds with ease. In addition, the Farpoint features a stowaway back panel that allows you to zip the hipbelt and harness systems away for a slimmer profile when traveling. This vintage-style travel backpack is ideal for the traveler that likes to turn a few heads as they walk through the airport. The pack’s exterior is made of premium-quality cotton canvas and polyurethane and the pack offers total dimensions of 13” L x 21” H x 7.5” W.
The WITZMAN Canvas Rucksack is a 2-in-1 travel backpack and a duffel bag. It comes with an additional duffel shoulder strap that can be detached and stowed away when not in use. It also boasts two front zipper pockets, a side pocket, and the main pocket with a laptop window that fits 12 to 16-inch computers. Lastly, this backpack’s padded mesh shoulder straps are safely tucked away in a zippered pocket until you need them. Designed for the daily commuter in urban environments, the Timbuk2 Command travel backpack meets the needs of the on-the-go business traveler. The pack offers a number of features that makes airport travel easier, accessing vital everyday items more convenient, and keeping all of your belongings organized a breeze. This travel backpack is made of 400-denier nylon faille (2) with a tricot-lined floating pocket to protect sunglasses or a smartphone. The pack’s internal laptop compartment, which fits laptops up to 15 inches, is fully padded and lined with quilted tricot fabric. Additionally, this travel backpack features a padded front pocket for iPad mini storage, compression straps for storing jackets or yoga mats, and five smaller exterior pockets for organizing items to which you need quick and easy access. The Hynes Eagle 40 will provide just as much value to the daily commuter as it will to the international business traveler. This backpack has been designed to be durable, versatile, and stylish, as well as to carry the exciting potential to enhance any travel experience by making it easier to carry all your essentials in one organized place. This travel backpack is made of water repellent polyester. It offers a capacity of 40 liters in total and comes with dimensions of 20.1” H x 13.4” W x 9.8” D so that it will fit in the overhead compartment or under the seat in front of you during air travel. The pack also boasts multiple exterior compression buckle straps to secure your load. Finally, suppressible shoulder straps make this pack convertible from backpack to duffel bag in seconds. The Osprey Porter 46 provides travelers with the perfect fit between undersized duffel and an oversized backpacking bag. The pack boasts a total capacity of 46 liters and has dimensions of 23” H x 15” W x 13” D. It is made of nylon construction and does offer D-ring attachments for adding a separate shoulder strap if you desire. This travel backpack features Straightjacket compression with padded wings and a lower panel that works in harmony to secure and protect clothing and gear. It also boasts a protected laptop sleeve in a rear panel that locks for security and easy access when traveling. Finally, this pack’s shoulder harness and hip belt can be stowed away for safe travel through airports, in taxis, and wherever else your travels take you. This travel backpack has the features to make traveling simpler or to provide excellent value on your next overnight camping trip. For the traveler that values versatility over all else, the Kelty Redwing 44 is an excellent choice. The pack’s combination of versatility and convenience make it the perfect companion for quick getaways. This travel backpack boasts a unique hybrid-loading U-zipper design that makes it both a top loader and a panel loader all at once. It comes with an exterior stash pocket on the front of the pack that’s great for tucking away your passport, maps, and other essential items you need to access quickly. Also, this travel backpack features a hydration sleeve that doubles as a safe storage area for your laptop or tablet. This backpack is meant for the lifestyle or outdoor photographer that needs to handle rugged conditions and keep their gear safe along the way. It offers three friendly points of access to internal contents: side quick camera access, lay-flat clamshell opening, and the adjustable roll-top closure. The best part of the roll top in this pack is that it can be expanded to create an extra five liters of total storage capacity. The WANDRD PRVKE travel backpack contains a laptop sleeve that fits computers up to 15 inches and makes getting through airport security simple. It also comes with a removable, modular camera cube that offers customizable storage for a complete camera kit, including a DLSR and up to 8 lenses. By removing the cube, the pack converts to a fully functional daypack. The Patagonia Black Hole backpack is designed for the traveler that wants a rugged pack that will stand up to being thrown around a bit. This pack is made of 450-denier ripstop polyester that withstands scuffs, scrapes, and miles of rough handling while keeping the internal contents safe and secure. It’s a weather-resistant pack that features a total capacity of 30 liters and a weight of just 2 pounds, 2.7 ounces when empty. This travel backpack’s main zippered compartment comes with a padded sleeve that can hold a hydration reservoir of laptops and tablets up to 15 inches. The pack’s exterior is coated with a TPU laminate for added weatherproofing. Internal features include a mesh pocket with a key keeper and an organizer panel to keep easy track of phone, wallet, and other small everyday items. Gerry Outdoors was the first company to invent a backpack with a zipper way back in 1938. (3) Before that, school children were largely using bags with straps and backpacks used by hikers and recreationists used other means of securing their contents. Since the 1930s, the size, shape, and functionality of backpacks have exploded exponentially. We’ve put this Buyer’s Guide together to help you learn more about what separates one pack from another. In doing so, we’ve focused on a number of factors about backpack construction that you must consider in the selection of your new travel backpack. Denier count is the most widely used term for describing the strength of the fabric used in today’s backpacks. However, the type of fabric utilized in backpack construction is just as important, if not more so, than the thickness of that fabric. In this section, we’ll describe a few of the common fabric types you’ll find in common travel backpacks. Cordura® nylon is a popular one that you’ll see in a lot of backpacks today. In fact, Cordura® isn’t its own type of nylon at all. Rather, it is a brand that offers many different types of fabrics. In essence, the Cordura® brand inspects materials from a variety of different mills, picks the ones that are up to their standard, and then puts their ‘Cordura®’ tag on it. They do, however, tend to put that tag on only the highest quality fabrics out there. The other brand name you’ll see attached to nylon is ‘Kodra’, which is essentially the same thing as Cordura®, but it is made in Korea. Polyester is another fabric often used in backpack design. It is made from plastic fibers that tend not to be the best choice for a travel pack. When it comes to travel packs, you’ll often see ‘ripstop polyester’ which, like ripstop nylon, is made with a special weave that makes it much stronger and more durable than standard polyester. While packs that use polyester can be more budget-friendly, they won’t stand up to the heavy abuse that can come with traveling. Canvas can be viewed as one of the original backpack materials, along with leather. Aside from burlap, canvas was the go-to material for all of the early backpacks and cargo bags. Canvas is very thick and sturdy. Historically, canvas was stitched together using cotton, linen, or hemp before being coated in wax for waterproofing. Today’s canvas options are more typically made with nylon and polyester and canvas is much less common than it used to be. That decrease in popularity can be attributed to the fact that canvas is heavier, more easily damaged by abrasion, and less water-resistant than other modern materials. Shoulder straps will be largely responsible for the comfort of your travel backpack. The type of straps that work for you will depend on your unique body type. Even when your pack isn’t completely full, it can be uncomfortable to carry if the straps don’t match your body. For some people thinner straps may be more comfortable than their bulkier counterparts, but typically this is only the case if those straps are also highly padded. There are some packs that offer swivel straps for increased adjustability across varying shoulder widths. This type of strap also makes it much easier to turn the pack around to access its contents when needed. Curved straps (as opposed to straight straps) also tend to work better for women or men with larger chests. Finally, if weight is your primary concern, make sure to look for a pack with load lifters. These are adjusters that are located at the top of the straps where they attach to the body of the backpack. These adjusters give you the ability to change how the pack’s weight sits on your back. In doing so, they make a pack much more adjustable to a wide variety of body types. Zippers are the most common weak point in packs that claim to be weatherproof or water-resistant. The best type of zipper on the market today is a YKK zipper. They are very strong and come in different weights according to the specific area on the pack where they’ll be applied. (5) YKK manufactures their zippers in-house, including smelting their own brass and forging their own zipper teeth. Choosing a pack with YKK zippers will help you ensure that you won’t suffer broken zippers while traveling. Top-loading packs are those that offer one opening (at the top!) for loading and unloading gear. Panel-loading packs offer a larger zippered pocket that allows you to lay the pack flat and have greater access to its contents, almost like a regular suitcase. While top-loading packs are still the preferred variety for long, multi-day treks and other outdoor activities, traveling is so much simpler with a panel-loading pack. It allows you to worry less about the specific order in which you pack your belongings and gives you easy access to that swimsuit buried in your pack when you receive a last-minute invitation to go surfing! Because we’re talking about travel backpacks, versatility is the name of the game. A quality travel backpack can handle a variety of environments and travel experiences while adapting to your needs in each scenario. Compression is one of the ways in which travel backpacks showcase their versatility. Proper compression allows you to hunker the weight of your pack down even when it’s not completely full. This means that things won’t feel like they’re rattling around back there when you’re walking or running to catch a train. Another benefits of compression straps is that they also allow you to secure additional items to the pack’s exterior if it’s already full. Security is crucial when traveling, especially if you’re constantly exploring new and unfamiliar environments. You should feel comfortable knowing that your belongings are safe and sound when you leave them behind at the hostel for a grocery run, for example. Having a travel backpack with lockable zippers is a great way to ensure your belongings are always safe and secure. RFID blockers are another interesting feature growing in popularity for international travel. These will keep unsavory characters from scanning your passport or other sensitive documents as you pass them by. Some backpack designers have begun incorporating stronger materials to reduce this possibility and to make it harder for thieves to ‘slash-and-grab’ items from your pack. The former is probably the more common occurrence, so if you have to pick one over the other, look for a pack that uses stronger fabrics, such as Cordura®, before you start worrying too much about the world of RFID technology. There are always a number of logistics to align when traveling, whether it’s for business or personal reasons. In this list of Frequently Asked Questions, we’ll answer some of the most common concerns about travel backpacks so that you can turn your attention to the rest of the logistics for your trip. What is the maximum backpack size for carry-on luggage? While we wish there was one standard answer to this question, it’s important to remember that every airline has slightly different rules concerning carry-on size limits (6). Speaking very generally, the maximum backpack size for carry-on luggage is about 45 liters. The good news about backpacks, when compared with other luggage types, is that the sides are compressible to make squeezing them down to the prescribed dimensions a bit easier. Why travel with a backpack? Backpacks make it so much easier to navigate new environments. Suitcases are much more difficult to store in buses, under seats, and so on and so forth. Suitcases with wheels don’t roll very well on dirt or cobblestone roads, and carrying them over a distance is uncomfortable and tiresome. For today’s adventure and business travelers, a quality backpacks beats all other options. Are any of these backpacks 100% waterproof? While many of these packs are water-resistant or have been thoroughly weatherproofed, you’d be hard pressed to find a travel backpack that is truly 100% waterproof. Many will hold up just fine in a 20-minute tropical downpour (and keep your belongings dry throughout), getting your pack to be 100% waterproof requires buying an external rain cover and putting it on before heading out. What is bluesign® approved fabric? You may see some brands advertise the bluesign® approval. This is a standard that is largely considered to be the strictest in regards to environmental protection, workplace safety, and consumer protection. Seeing a product with this label means that all the materials used in that product have gone through a rigorous testing process and met the criteria and limits of the BSSL restricted substances list (7). There’s really no limit to how far you can travel with the right pack on your back. The benefits of having just one travel backpack to worry about are numerous, and travelers will surely enjoy the ability to get around easily with all that they need securely on their backs. We hope you’ve enjoyed this collection of the top ten travel backpacks and we wish you the best of luck selecting the right pack for your next adventure.